As I’ve mentioned before, The Handmade Forum is a group of crafters from around the world who have banded together to share advice, bit of promotion, and sometimes just bond over both the good and bad of doing handmade things in a world that seems to value them less. For January the formidable Katie suggested we create treasuries for the new year, showcasing the makers from the forum. I liked the idea. Every time I create a treasury, I get a better feel for these shops, and because of the way I approach making a treasury, the process is always an interesting mental exercise. So, as one of the first items I saw when perusing the shops of ‘The Handmade Forum’ for the treasury involved a gleeful memory and a smile, I decided to build a treasury of those sorts of things. We will begin with the doll that sparked the entire idea, from Joelle’s Dolls. I assume, of course, that this chap was inspired by the archetype he represents, or by someone she personally knows, rather than what he reminds me of. 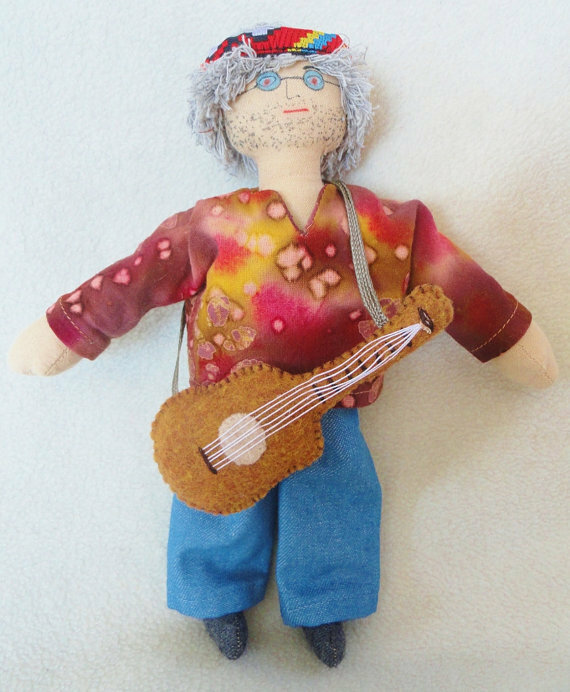 However, back in the day in Santa Fe, I met a bloke near the Plaza who had a guitar, and shared a number of other traits with this doll. We had a long rambling conversation about everything from music to religion to tolerance to… It was a pleasant couple hours that randomly disappeared in a puff of companionship. From Uniquely U Jewellery I selected these earrings. Doesn’t matter what time of year I see them, or what kind of day I am having, butterflies evoke a number of different very happy memories. There is something amazing about the beauty of their structure, and I’ve seen a living butterfly’s wings up close, without having to damage it. Additionally, butterflies are connected to one of my very good friends, so they also make me think of her. Thus, these earrings fall into an unusual category for me. They are something I would actually wear (rare, for me, with jewellery) – and something I could also gift. From Insomniac Treasures, I selected this recycled vinyl clock. To start, I love her shop name. 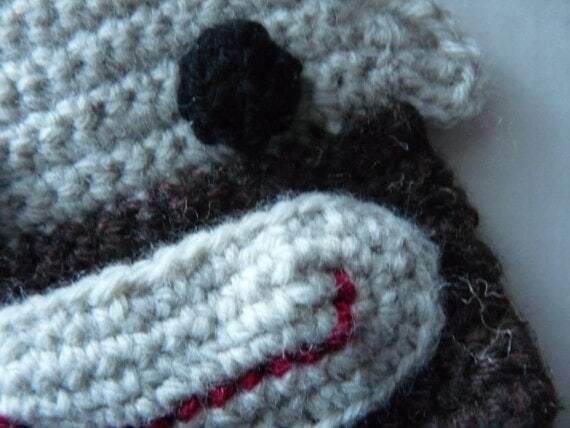 Given the number of different things I’ve crafted or fiddled with, from words to notes to teas to things of yarn and beads… I understand creation through insomnia, or creation provoking insomnia, or… And, despite what Mister Tea says, I do actually sleep. Well… I at least attempt to from time to time. As far as the chosen object itself, there were a number of reasons it perked up the bits of my brain that have been feeling doldrum-y of late. For one, it is a recycled thing. We like recycled things. We repurpose a variety of things ourselves, and try to keep all things attached to our shop as eco-friendly as possible. I have more than a mild fascination with shops that reuse/repurpose/recycle/remake/reshape and generally give old things new life. 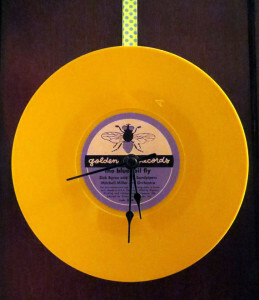 On top of that, it combines vinyl and a clock! These are two things that Mister Tea and I collect, so the combination of the two is a happiness. From the Art of Emaan I found this painting. As you know, if you follow our shop or our posts at all, Mister Tea and I are geeks. 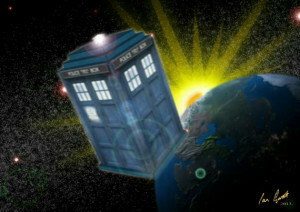 And one of our geekdoms is Doctor Who. It is a show that has always portrayed a universe of both whimsy and depth, running the entire spectrum in the emotions that it can provoke. And there is always wonder within the tales. He only has a few paintings listed, but his other work is quite neat, as well. I have already waxed rhapsodic in a few places about Flaherty Naturals. 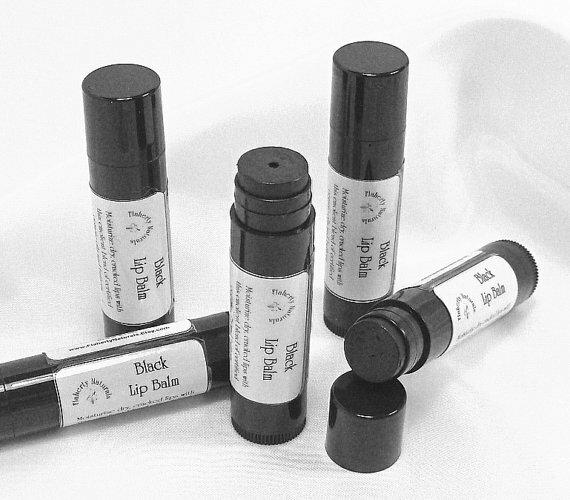 From her shop I chose something that may seem a bit odd in this collection – a black lip gloss. May seem a strange thing, given my current occupation and that it might be assumed I would have always had more in common with the doll that was the first offering in this post… but there was a time in my life when I flirted with being a goth. In the end, being a ‘proper goth girl’ ended up being entirely too much work, and seemed to involve wearing the kind of heels I find uncomfortable and impractical. So I drifted back into my weird conglomeration of aesthetics. I do, however, have a number of good memories of the time, and met some people I still cherish through different aspects of the subculture. Continuing the theme of connections and happy thoughts about people I know and care about, we move to my selection from Quinny’s Crochet. This sock monkey bag made me giggle. Our god-daughter had a thing for sock monkey for a while. It actually informed our choice of the coasters we picked up to have around so there would always be a coaster that was ‘hers’ for when she visited. From Maisy Plum I selected this necklace. The reason for this is pretty succinct, and perfect for the theme and intention of the treasury. 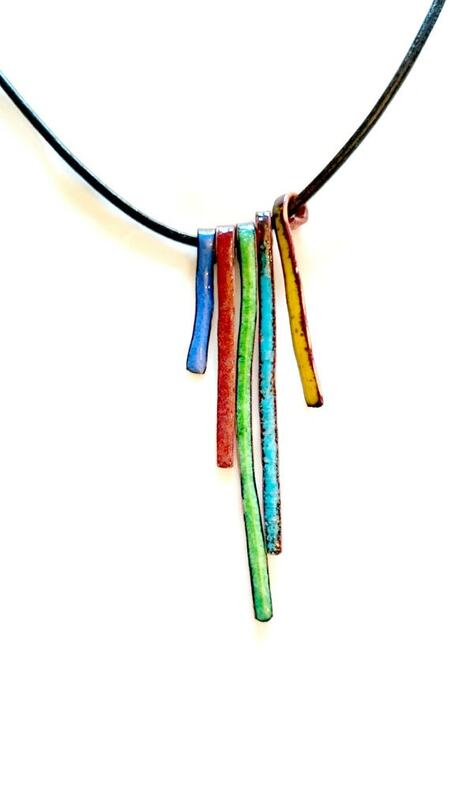 When I saw the picture of this necklace, my inner child cried “Squiggles!” and wandered off giggling into the depths of my brain somewhere. I love that this can provoke that level of whimsy and also embody the level of craftsmanship and work that this piece entailed. From Gibson Girls Gone Wired (another shop name that fit all by itself), I selected this ear cuff. There were several reasons for this choice. 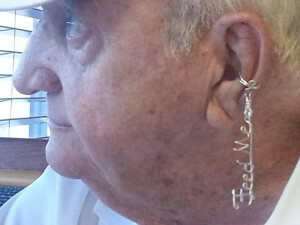 The first one was that the gent modeling the ear cuff reminded me a bit of a very dear soul who passed on recently. He was an amazing man, and the good memories of him stack up so high and so swiftly that being reminded of him always makes me smile, even if it is a touch bittersweet. Lastly, I really like the concept behind a lot of her customized wire work. Names or particular sentiments or things that are particularly yours or meaningful – the option for this is a Good Thing. From Katy Sue Knits I chose this hat. 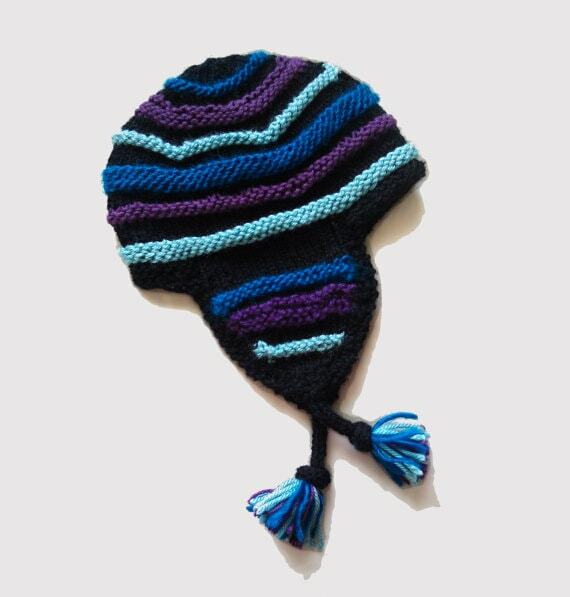 It made me think of ‘The Hero of Canton.’ As an added bonus, it is knit with blues and purples and contrast and…. Tassles! 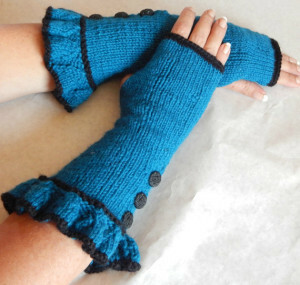 From Black Raven Creations I chose these gloves. For reasons I cannot entirely put my finger on, I saw these and immediately thought of ‘Alice in Wonderland.’ When I first read the book, I wanted to wander that world. Danger, oddities, impossibilities… all of it. 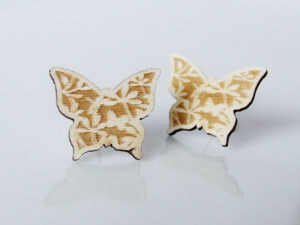 From Huewood I chose this pair of earrings. Going back to old memories and connections to Santa Fe…. During my time working as part of a liaison company (making a connection between doctors and pharmaceutical companies) – I met this fascinating graphic designer. She did all the design work for the company I worked for, from logos to brochures, and she was A Character. She filled every room she was in with a bright strong personality, and with the rainbow of colours she wore. 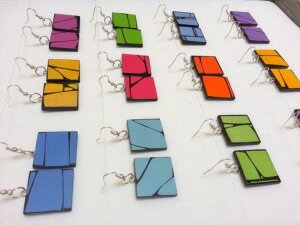 She also liked strong shapes to go with the array of colours. I saw these and thought of her, and of her designs. 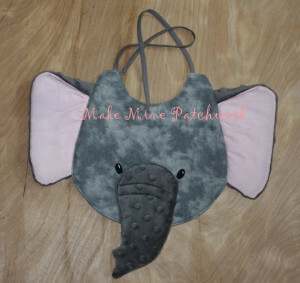 From Make Mine Patchwork, I chose this bib. I am fairly well in awe of her work. I have done some crazy quilting, here and there, and helped my grandmother with a couple of full quilts… but haven’t quite been brave enough to try to do it myself, as yet. The last object in this treasury ramble is another odd one. I chose this bracelet from Bracelets By Jen. Where’s the fun in this one? 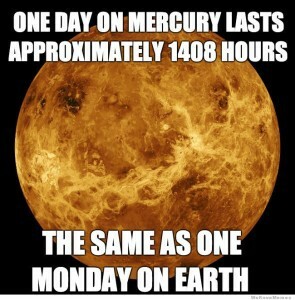 – you might ask. Well, on the one hand I can point you to the style of bracelet. 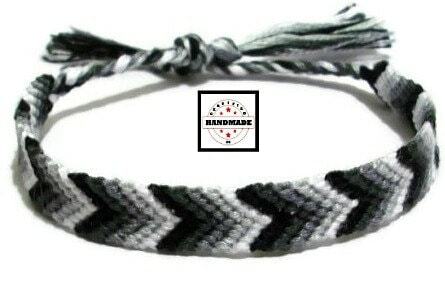 These are called ‘friendship bracelets,’ meant to be something that you can wear through all the wear and tear of life to remind you of a particular relationship. However, there is even more meaning to this one for me. My left eye doesn’t really see colour. I have a genetic abnormality that means the sight in that eye is fair close to black and white. This has complicated my interactions with colour for a long time. 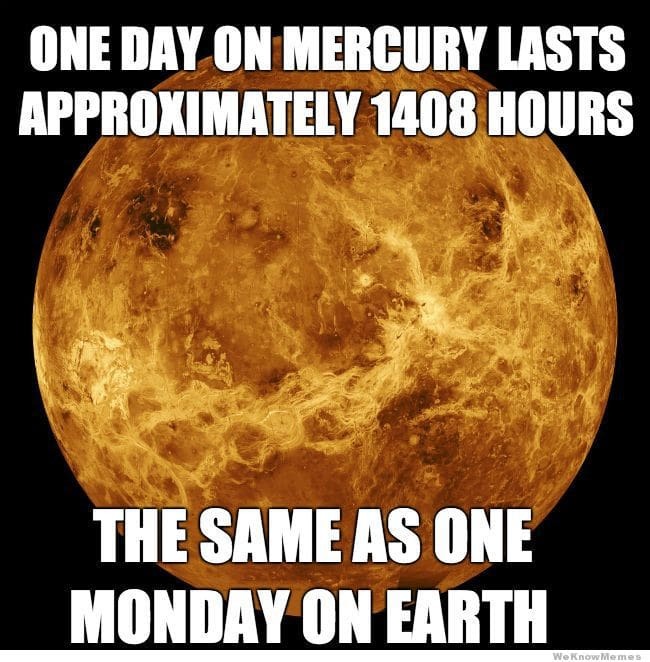 It was particularly funny when I was younger, before I found out that I actually saw the world in a sizeably different way than most people. Pastels were, and still are, the hardest colour set for me to distinguish between, if I’m looking with both eyes. You can probably imagine the eye-rending horror of some of the Easter clothes I would quite innocently put together, thinking they matched perfectly. The colours in this particular bracelet are in a set of tones that are “eye comfy” for me. The thing is that it is the differences in how we see the world, whether it be from a strictly physical problem, like my left eye; or the more complicated differences brought about by our life experiences that bring about some of the beauty in our relationships, in our learning, and in our crafts. So, this has been the rambling rationale behind my treasury “Whimsy and Borogroves.” I hope there was a smile or two for you during it. Quinny’s Crochet gave us this spot of brightness. Joelle’s Dolls gave us a collection of blues to beat the blues. Uniquely U Jewelery gave us a collection of gentle neutral colours and shapes, with some bonuses for helping find relaxation. ArtofEmaan brought us this collection of things he found beautiful amongst the wares of the forum. Black Raven Creations created a collection of green, to remind us spring is coming. Huewood brings us a set of warm oranges and golds and yellows. Insomniac Treasures also made a “let’s not think of winter” collection. Flaherty Naturals created two for our viewing enjoyment: Winter Whites and Hot Finds. This entry was posted in Ramblings, Treasuries and tagged 2015 January Treasury, Desert Sage Ramblings, Gift Ideas, The Handmade Forum by DesertSage. Bookmark the permalink. Very much welcome. Glad you enjoyed it. Very enjoyable read and evokes different ways to look at things, it is amazing how people can look at the same item and get a totally different feeling from it. And you have returned the favor of brightening a day by surprising me as I read your ramblings 🙂 My gentleman model is my 83 year young father, who after losing mom 18 months ago, is my constant companion and biggest fan. Glad I could do so.